The Eurofighter Typhoon is a twin-engine canard-delta wing multi-role aircraft. It has been designed and built by a consortium of three separate partner companies: Alenia Aeronautica, BAE Systems, and EADS working through a holding company Eurofighter GmbH which was formed in 1986. The project is managed by NETMA (NATO Eurofighter and Tornado Management Agency) which acts as the prime customer. The series production of the Eurofighter Typhoon is fully underway, and the aircraft is being procured under three separate contracts (referred to as "tranches") The aircraft in single and dual seat configurartion, has entered service with the Royal Air Force, the German Luftwaffe, the Italian Air Force, the Spanish Air Force and the Austrian Air Force. Some years earlier, the Swedish SAAB company developed the Gripen. This aircraft is used in Sweden, Hungary, South Africa, the Czech Republic and soon Thailand. It seems the developers of the aircrew life support system, looked to the Gripen developments. When flying the Typhoon, the pilot is seated on the Martin Baker Mk.16A ejection seat. Derived from the US Navy Mk.14 seat, the Mk.16A is some 30% lighter, this is achieved by combining the twin ejection gun outer cylinder tubes as both the propulsion system and the seat’s primary structure. The seat offers high comfort levels, and is integrated with an On-Board Oxygen Generation System (OBOGS), chemical defence, and communication systems. The narrow head box contributes to Eurofighter Typhoon’s excellent rear vision. The simplified combined harness allows unassisted strap-in, and the passive leg restraint system avoids the need for the pilot to wear restraining garters. The flight jacket is attached to the seat harness to restrain the pilots arms in case of ejection. 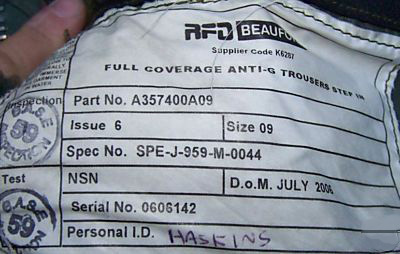 The same feature is also seen on the Swedish 'Armfixerjacka 97/K' that shows more similarities to the Eurofighters jacket. Besides the arm restraints, the RFD Beaufort made jacket incorporates a life preserver (horse collar type) and pockets for survival gear. Above 40,000' pressurised oxygen is delivered to the aircrew via their oxygen mask at a positive pressure to help prevent symptoms of hypoxia caused by high altitude. However, such high pressures can lead to distension and damage of the lung. 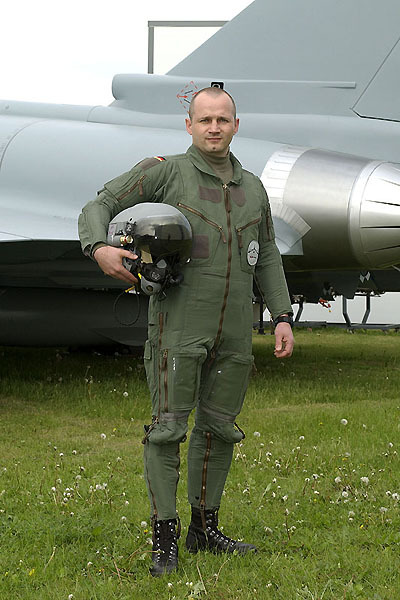 The Eurofighter flight jacket contains air filled bladders that surround the chest wall. These bladders which are filled with gas at the same pressure as gas in the mask. This prevents lung distension so eliminating the risk of lung damage. The same concept is used in, for instance, the USA developed Combat Edge system. The first jackets stated 'Eurofighter flight jacket' on the label, the later ones only say 'flight jacket'. 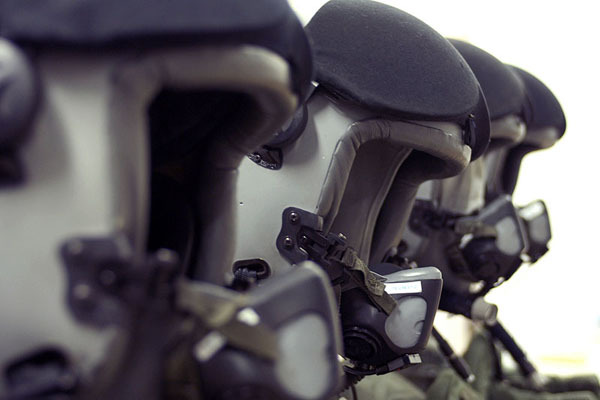 The pilots use several types of helmet, depending on the air force they fly with. The most sophisticated one is the two part BAE Systems Striker. 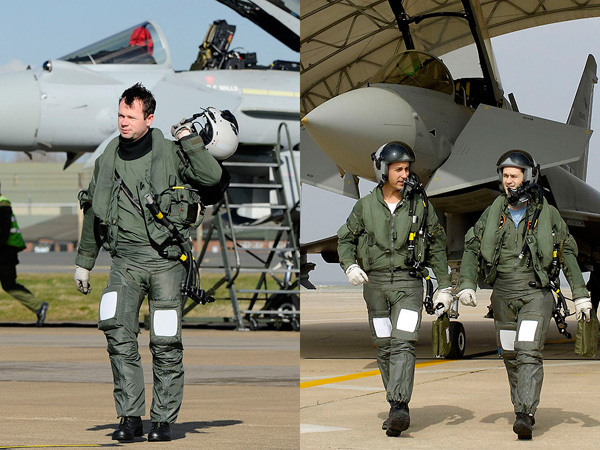 This is a helmet-mounted display developed for the Eurofighter-Typhoon fighter aircraft. Basically, Striker is a high-resolution binocular, visor-projected, night-vision-capable helmet driven by powerful processor and graphics modules. Its built-in tracking system is a high-speed, high-accuracy, low-latency optical system which enable fast engagements of airborne targets. The helmet displays virtual head-up display symbology and video imagery from the aircraft sensors and from a helmet-mounted, image-intensified night vision system. In addition, the helmet integrated design provides head protection, life support, electro-optics, and the fully integrated respirator for protection in nuclear, biological, and chemical warfare environments. The normal dual visor (day time) version weights 1.9 kg including oxygen mask, the night version weights 2.5 kg. The modular NVG version part, has two night vision cameras attached to the sides of the helmet. This is visible in the above image of the German pilot. BAE Systems began testing on this helmet in early 2005. Eurofighter validation flights with pilots using Striker helmet were planned for the later of the same year. As of March 2005, the Striker has passed 600-plus-knot windblast and 600-plus-knot ejection certifications. High g comfort and stability testing was carried out aboard Hawk trainer aircraft. Production availability was scheduled sometime in 2005 with the production helmets integrating into Tranche 1 and Tranche 2 Eurofighters. BAE Systems along with Saab AB and Denel Optronics of South Africa developed a helmet-mounted display that builds on the technology of Eurofighter's Striker helmet. This helmet looks like the Striker helmet, but is named Cobra. 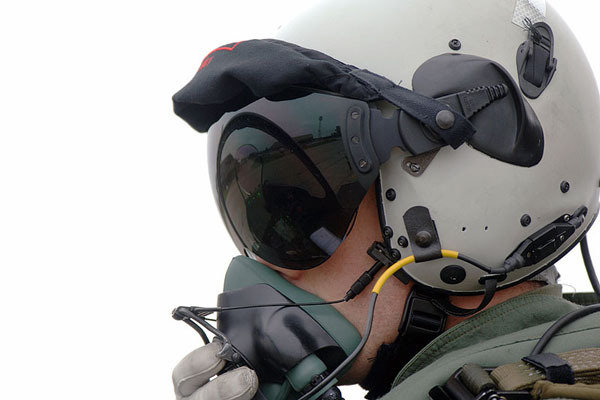 When not wearing the Striker helmet, RAF pilots wear the Alpha 300 or 700 flight helmet by Helmet Systems Ltd. The German and Spanish crew, use a Gentex made ACS (Air Combat System) helmet with modified MBU-20 style mask. The re-inforced mask hose goes backwards instead of directly down. The ACS system, is developed from the original TLSS (Tactical Life Support System) program. This system was not adopted by the US Air Force due to problems of compatibility with existing systems. The Air Combat System utilises the TLSS helmet and MBU-20/P mask. Since the TLSS helmet system uses a proprietary and unique suspension and occipital air bladder interface, the MBU-20/P mask has been fitted with the necessary connections that the TLSS helmet requires. Instead of the standard TLSS visor attachment, a permanent twin-visor assembly as been fitted that features infinitely adjustable rotary positioning control. Kevlar is used for the shell and the special inner ventilation distribution system that was originally an integral part of the TLSS helmet’s NBC protection system has been omitted. The oxygen inlet hose it fitted to the right side of the facemask, instead of the left (as on most CE systems). The Air Combat System, although not procured by the US Air Force, has recently been in limited use among several European nations like Finland and the export McDonnell-Douglas F/A-18 aircraft is currently one of the few aircraft that the system is flown in. It is an excellent system, however, being a pure fighter/combat version of the TLSS system in which TLSS chemical protection and anti-flash capabilities have been left off. Besides the Libelle suit, pilots wear their normal suit like the Mk.14 for the RAF aircrew. Note: Some Images were taken from www.eurofighter.com and text used from Christopher T Carey's article on TLSS systems.